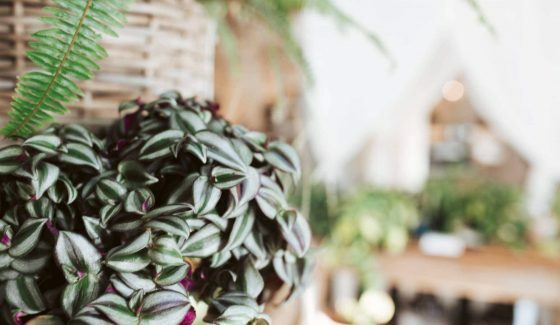 I recently gave a sneak peek into my love affair with Arhaus, the home furnishings mecca that wooed me with its authenticity, fresh influence and global flavor. With the goal of upping our interiors game for a more chic and contemporary coastal vibe, we embarked on a long overdue living room reinvention. Now we have completed this we are already looking ahead to adding balustrades to the home. I think somewhere like Pear Stairs would be able help us in this department. Looking back, it had to be ten plus years since we last bought new furniture. And if I’m doing the math correctly (in dog and kid years) that’s approximately 42 years of furniture wear and tear! Based on the stained fabric and flattened cushions alone, it was no secret that we were long overdue for an upgrade. 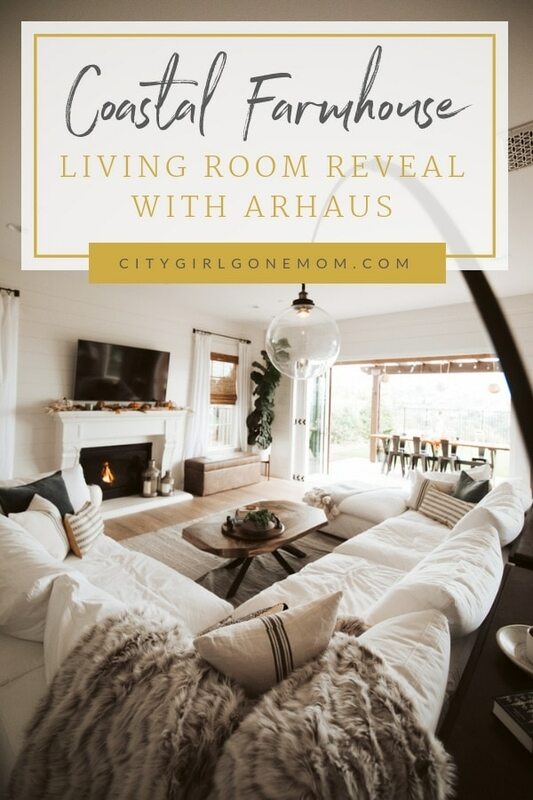 With some of the most gorgeous tones and textiles a design-obsessed mama could dream of, what I actually valued most was the fact that Arhaus made the entire experience feel like a collaboration – as opposed to a transaction. And that’s when I knew this redesign was well worth the wait. Although many people choose to redesign in stages, I wanted to start with a clean palette – partially why we waited so long. So, before beginning, we donated all of our old furniture and shiplapped the walls for a fresh new coastal look. After meeting with the Arhaus design team for a virtual overview of the space, we selected some key pieces, starting with the Tahoe Slipcovered Sectional. Comfort and versatility with real goose feathers and generous cushions are what make this the ultimate lazy Sunday sofa. And the soft, tailored slipcovers are exactly what we need to get through the next decade of delightful destruction. As you can see it’s just been a hodge-podge of items with no direction and lacking in style. It served us well while raising kids, but one of the best words of advice the team at Arhaus gave me was not to wait till the kids were gone to have the living room of your dreams. Live now!!! And I couldn’t agree more. Why was I going to wait 20 years to have a living room I always wanted? Call us gluttons for punishment, but when it comes to the focal point of our living room, my husband and I have always preferred light and bright. If I had a dollar for every time we’ve been asked, ‘Why on Earth would you ever have an all-white sofa?’ we’d own a second home in Tahoe, likely with another white sofa! My answer? Because we prefer to have our cake and eat it too…. even on the couch. The coastal farmhouse transformation started with shiplap and plenty of it that would even make Joanna Gaines happy. I felt the texture on the walls really worked with our select pieces from Arhaus. We opted for the entire downstairs to get done for a more seamless feel. The generously cushioned Tahoe Sectional is designed by upholstery artisans to envelop you in plush, “sink-into” comfort for hours of relaxation. After flipping through handfuls of swatches, I particularly took to the stain resistant options – a no brainer for the sticky fingers, toes and paws to soon encounter the otherwise risky white and dove grey Tahoe Sectional. Each deep seat of this customizable, craftsman-built collection is thoughtfully supported with durable, reinforced frames and expertly fitted in soft, tailored slipcovers for an easy-to-maintain, casual style. I did get two colors so I can change it throughout the year. We chose two A-frame tv consoles for behind my sofa. Besides looking beautiful, the two pieces are perfect to section off the living room. They also have great functionality by holding books, decorative dishes, plates and more. Even though this piece is a TV console, I was able to use it behind my sectional. It also compliments the coastal farmhouse theme I was going for. The top of each piece has an enduring bluestone that is cut from the mountains of Northern China and sculpted by hand before being inset into the top of this chic piece. And the A-frame cabinet is expertly crafted from naturally beautiful pine from Finland, that Arhaus’ craftsmen have sanded and hand-painted before careful distressing to create a weathered appearance. Perfect for storage and for pulling my living room together. One of my favorite pieces because I feel its the perfect blend of reclaimed wood colliding with an industrial frame. Expertly crafted from exotic, Mexican Palografico wood, the Carrina Coffee Table is made from tree trunks found submerged in water for many years. Each veneer used to form these stunning surfaces features a gorgeous patina created by natural discoloration and weathering. Tabletops are carefully shaped by Mexican artisans, who give each piece its sophisticated, faceted design. The tripod table base is made from steel with a gorgeous satin gunmetal finish to complement the tops’ natural beauty. I cant begin to tell you how appreciative I am for my two storage benches. I chose a recycled leather as my upholstery and I am in love with its durability and multi-function for either sitting or for storage. The soft, pillowy headboard is painstakingly upholstered by hand and adds a dramatic focal point to my space. This globally inspired handcrafted flatweave rug added fresh style to the design of my living room. The hues of grey and ivory truly compliment whatever color palette I choose to go in. I do love how my brown leather benches work with it. Its reminiscent of a well-traveled family. For this piece I am forever grateful for the design team. This is something I would have never picked out hadn’t been for them. For its dramatic effect and its practical application, I am officially in LOVE with this lamp. I now have a little nook in the corner that I claimed as my own. The light overhead perfectly illuminates the space. We chose an array of pillows because when it comes to textures, mixing them is best. From the faux fur to the stone washed velvet square pillows, all of them pulled the look together. I also recommend mixing not just the textures but the sizes. Besides pillows, throws are also a must. At the very least I would suggest two. We opted for a marble grey knit with pom moms and the Faux Fur Cameron throw. One thing Arhaus has plenty of is art. For my space we chose a black and white photo of a peacock feather. This image has been enlarged to a grander scale to capture its beauty with organic charm. We opted for a teak windowpane mirror, which for me gave me the perfect coastal farmhouse feel. I love the distressed wood and how large the scale is. In our house, the living room is where we relax, unwind and connect as a family. After my design collaboration with the Arhaus team, it’s now the source of comfort and inspiration. With its fresh tones and textures, including intentionally selected accessories like plant life, books and leather trunks that double as toy boxes, it also provides a sense of happiness throughout my at-home work days. Call me crazy, but as a stay-at-home working mom of four, those things matter, and I’m extremely happy in our new space – especially when I peer over at the Peacock Feather Triptych, of which my husband initially had hesitations. Now, he can’t stop staring. Thank you, Arhaus, for making our house a comfy yet chic haven for living life. Maybe, just maybe, we’ll stay home a bit more and enjoy it. PrevWhere to Stay in NYC? The Parker New York. Can’t wait to sit in that beautiful living room with you….someday! Looks amazing! That couch….heaven! ? I love how the big sectional couch allows for watching TV together or letting the whole room engage in conversation. My favorite piece is that globe lamp, though! What an incredible reveal! Your room looks so amazing and inviting! I love the overall decor of your living room! That looks absolutely gorgeous! I wish my house looked that good! Can you come decorate my place! I would love this look! Wow it turned out beautifully! And I think the advice they gave you is perfect – why wait? Have your dream now! 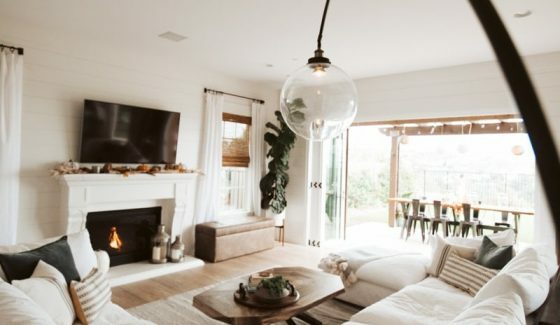 I love how warm and cozy these rooms look. The decor is just beautiful. Very welcoming. I am obsessed with your decorating style! I have a new fixer-upper and am stealing so many of your ideas lol! Oh wow! I love what you have done with your home! It is GORGEOUS!! I’ve always loved the farmhouse look. That’s what I’d love to do for my home as well. These photos you have are so stunning! These decorations are what my future has will look like! Love it! Obsessed!!! Love everything about this. perfect! ? ?